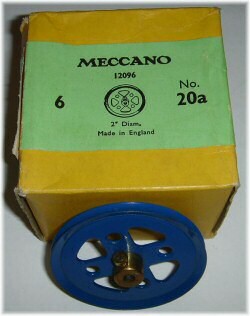 This page also describes part 20c, the 2'' pulley without boss, a part supplied in the two clock kits of the mid-70's. The 2'' pulley was initially a cast lead alloy 'flywheel', derived from the flywheel on the ill-fated vertical steam engine of 1914. It was replaced in 1915 by a WW1 'economy' version, created from a single steel disc with castellated 'teeth' bent in alternate directions. Two varieties of this part are known, one of very thin steel where the teeth are noticeably distorted by the cutting process, and one of thicker steel (about twice as thick). The more familiar 2'' pulley was created immediately after this, and remained in production without changes until the end of production. Of course, the pulley was available in all of the usual colours through the years. The photo above shows some of the pre-war colours at the top, and the only two post-war colours (black and blue). Although the special part 20c (2'' pulley without boss) is superficially exactly the same as the 2'' pulley (but without the boss, of course! ), it is in fact slightly different. The overall width is considerably less, as shown in the photo. The box to the right contains six 2'' pulleys. The light green label was added to small parts boxes in 1958 to identify parts that had changed colour between the medium green and light green eras. Although the parts in this box aren't light green (they're blue), the label shows they're new stock. A similar box with a yellow label (pre-1958) would contain black pulleys. The black enamelled ones are UK production that was exported to the US and are slightly less uncommon over there than here (!). The finish matches the earliest 3" pulleys and so in my view they predate the nickel ones. What about the width variants? I have what I assume to be a 1918 wide groove with black painted boss, even the screw. Considerably wider than traditional whereupon the tyres are a loose fit. From a US source. Were the early lead 'flywheel' versions ever made without a boss? I have a nickel plated one of the right diameter that looks very similar to the 20a.pb shown here, except for the lack of a boss. The plating goes over both faces of the axle hole so it doesn't look like a boss has been cut or knocked off. The widths of the bossed part changed as well, not just associated with bossed/unbossed. I purchased 8 black pulleys (not sure of exact era), then 8 blue ones (again - - -). The black versions were wide, 4 of the blue were narrow and 4 were medium width. The tyres that were on the black version wouldn't fit the narrow blues, and barely fit the medium blues, with some out-of-true noticeable on the mounted unit.